I haven’t played Anthem as much as I’ve wanted to. I find it difficult to play. Not because it’s a challenging game; it’s not, really. It just bothers me. Something about it rubs me wrong. It feels thin, and dull, in a way that personally frustrates me. Anthem, BioWare’s newest, is a lot of things. But incredibly playable isn’t one of them. What Anthem is, first and foremost, is an attempt to merge the distinct sensibilities of BioWare games with a genre and style of game the company has never made before. The developer is known for story-dense, meticulously crafted narrative role-playing games where the player occupies a specific role in a complex world that they play a part in shaping. Anthem is not that. While taking place in a world with the type of interesting storytelling ideas BioWare is known for, Anthem exists to the side of them. It’s a game more like Destiny, or The Division, part of the genre that’s known lovingly or pejoratively as a “loot shooter.” That is, a title that combines the rhythms of run-and-gun shooting games with the multiplayer shared world aspect of MMORPGs and the drive to get better stuff of a game like Diablo. Or, y’know, capitalism. It’s a strange fit for BioWare, a company whose games are often better to think about than to actually feel, that communicate more fluidly than they ever play. Anthem, like most games in its genre, sidelines its story for a game about spectacle, action, and grinding. There’s a narrative there, if you want it, but it’s buried, obscure, and poorly told, which is strangely standard for the genre. Which means that Anthem is, more than any other game in BioWare’s ouvre, reliant on feel, which is where my personal frustrations begin. Anthem‘s mechanical centerpiece are the Javelins, robot suits worn by the main characters that give them superhuman abilities and durability, allowing the heroes, a class of “freelancer” mercenary types, to do dangerous and violent missions behind the walls of cloistered human cities. Anthem is reliant on the Javelins to succeed as a game: playing in those mechanical bodies has to feel empowering, and thrilling, and worth doing for hours and hours and hours. Anthem has, within it, the potential to be something interesting. But I have not felt so annoyed playing a game in a long, long time. And, on the surface level, they tick off all the boxes. The Javelins can fly like Iron Man, and conduct super-powered combat on the ground. It should feel good to explore the wrecked, future sci-fi world of Anthem in them, breaking things and uncovering secrets. But it just … doesn’t. The experience of actually playing Anthem is stunningly pedestrian. Combat plays like a spectacularly thin third-person shooter, devoid of weight or feedback, with few weapons feeling exceptionally distinct from one another and the enemies almost uniformly dull and uninteresting to fight. 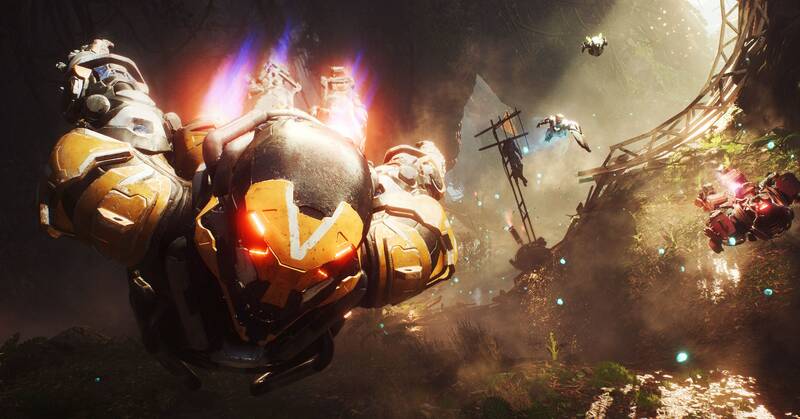 Flying around the world feels nice, but is entirely disconnected from fighting—Anthem apparently takes place in a world where no Javelin pilot has yet to master the forbidden, sacred art of shooting while flying forward. Then there are the bugs. I played on PC, a platform that seems ideal for a long-burn loot game like this. But it was mired by hitches, stuttering, and a variety of other obnoxious problems. I delayed this review to try the game out with its Day One patch, but even that didn’t solve how jittery movement feels. Often, movements that should be fluid felt hampered or pulled back by the game, as if faulty loading was rubber-banding the character backward at all times, a little weight I couldn’t shake. These problems will, likely, be fixed in time, but they so thoroughly combine with the game’s mediocre play to create a concoction that feels designed to frustrate and alienate. Anthem has, within it, the potential to be something interesting. But I have not felt so annoyed playing a game in a long, long time. There’s more to Anthem, including a lush open world, labyrinthine strongholds, long questlines. But I’m not going to talk about those things, because they all have one thing in common: the game’s core loop, its rhythms of combat and exploration. And if that central component doesn’t feel joyous, or provoke interest, none of the other stuff works. Destiny and its sequel remain the best games in this genre for the simple reason that, on the first hour or the hundredth, it feels good to shoot things as that game’s variety of space wizard. It is tight, and responsive, and fun. Anthem‘s core gameplay is none of those things. It is dull, and mildly tedious, and renders the entire setting a waste of imagination. BioWare’s latest is also, unfortunately, BioWare’s worst. For a developer with such a storied and successful history, it’s a shame.